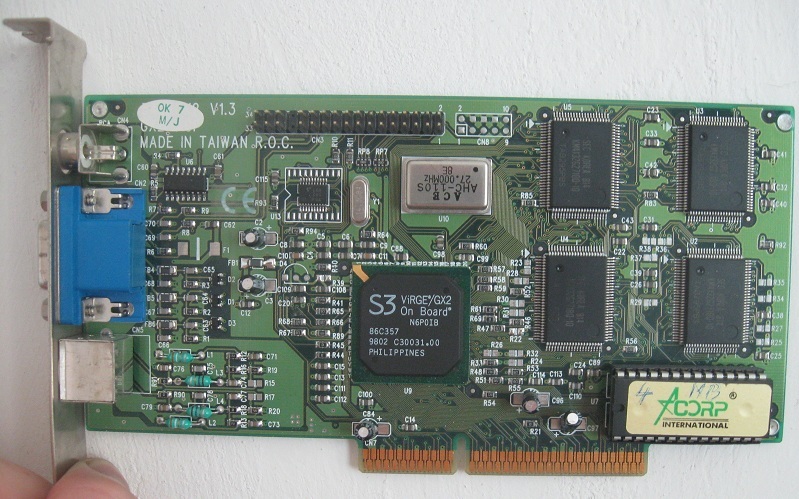 When Intel begun to push their new AGP interface later in 1997, S3 was launching third generation of ViRGE technology. For desktops ViRGE/GX2 "Home PC/TV accelerator", the first fully integrated solution with support for TV-out, dual display capability, AGP compatibility and DVD assisted playback. At the same time Virge/MX with dynamic power management was launched for laptops, making S3 instantly "mobile performance leader". However, this chip appeared on discrete cards as well, perhaps as a cheaper variant to GX2 thanks to lower clocks. Later S3 prolonged mobile success with ViRGE/MXi, which integrated 2 MB of 85 MHz DRAM into the chip for even higher power efficiency. But third Virge generation did not improved on shortfalls of the 3D architecture, thus big list of issues is similar to DX/GX. Here is my only MX, simplistic board without LVDS and video port. At the back is second 10ns SGRAM chip. Power constraints squished Ramdac speed back to 135 MHz. Memory is ticking at 83 MHz and chip seems to be set to usual 55 MHz. Why do I think so? When I compare it to GX, the MX is 11% percent faster. That incidentally corresponds with the memory frequency increase, but of course there are other factors- AGP bus, newer driver from spring 1999 and maybe some minor tweaks in the core. It is a small performance bump, but it cannot be denied. Biggest problem even with 350 nm manufacturing was sophisticated circuit and pipeline design to get it working at new low 3.3 voltage. There was second iteration marked 86c280, but I don't know what the difference is. And here is the performance peak of Virge technology, mighty GX2. It turns your PC into multimedia powerhouse with S-Video and TV-out. From the results it seems S3 finally bumped the clock from lazy 55 MHz into sixties, and memory is just 1 MHz short of 100. Even so GX2 stays quite cold just like other members of the family. Both GX2 and MX also had "+" models, which supposedly featured higher clocks. However I don't own them and cannot confirm their specification. Since the average FPS advantage of GX2 has been 19% and those cards are not likely bandwidth limited, I estimate the chip clock to be 66 MHz. 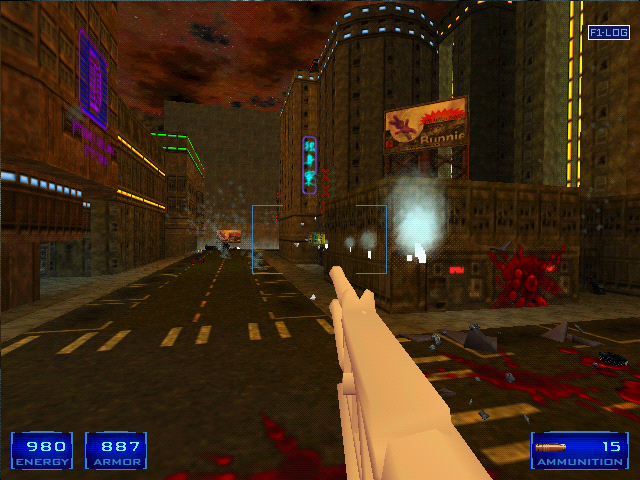 Still with around 15 FPS at 640x480 resolution "decelerator" jokes cannot be stopped. New chips, new driver releases. S3 legacy archive fails to deliver MX driver, but I found quite good one from Compaq, version 3009. It has a nice checkbox for video acceleration and more shockingly works with Unreal. With the "oversized texture without sufficient mipmaps" error finally solved, Virge does its usual quirks here too. Most people should avoid such depressive experience though. Grim Fandango suffers major FPS drop, but other results are in line with expected results. Exhausting list of alpha blending artifacts remains almost the same, but I noticed for example screen flashes in Lands of Lore 2 are fixed. I quickly tried to port this driver to GX2 with no success, so I stuck with older 2122 for the top dog. There is no support for low resolutions for GX2, so no tests at 320x240 and similar. But we finally got to speeds where we hit fps cap or vsync anyway. Sadly, these AGP Virges produces artifacts in s3d Terminal Velocity despite being supported through latest s3d toolkit. I have some doubts whether the toolkit was really updated for last Virge. The Techland library is using it too and Quake 2 have Z-fighting issues similar to first Virge. The latest version of the toolkit even brakes dynamic lighting, better to stick with older version 4. Also, if anyone needs it here is a "super uni driver". I modified inf of 2122 to accept first generation Virges and MX, with the option to use the better 3009 for MX. Quake wrapper and S3d patch are included. Looks like support for rectangular textures was added as well. Virge line was in the market for three years improving much slower than the industry. It progressed from 1996 to 1997 from feature rich but slow card to feature poor and very slow card. I mean while first Virge is so slow, it was born in time of little standards, mild competition and unclear future of the whole 3D accelerator industry. But to release one year after Voodoo Graphics chips with quarter performance and plagued by nasty old bugs is just sad. I personally cannot be so sarcastic about Virge, there is lots of effort behind every chip. But I have to wonder why couldn't company like S3 do much much better. It is possible they got sidetracked with ViRGE/T for Talisman API. S3 missed a product cycle and for one year was a sitting duck with disastrous consequences. We cannot end this just yet, despite covering all the Virge cores. The architecture with all its weaknesses lived on for much longer in Trio 3D. Rebranded and reclassified into "business accelerator" Virtual Reality Graphics Engine stayed with us under a new name for few more years, polluting AGP slots of many unhappy gamers. It is quite a paradox, the most infamous 3D architecture holding a record in market longevity. Because of this I covered them even if they fall out of my time scope.